On November 7, 2015, Xi Jinping, the general secretary of the Communist Party of China and the chairperson of the People’s Republic of China, and Ma Ying-jeou, the president of Taiwan, and a big name from Kuomintang (the main pro-China party in Taiwan), met in Singapore. It was the first time in history that leaders from both sides of the Taiwan straits had a face-to-face meeting. This meeting is by no means a historical image of reconciliation or a progress towards friendship. It is not an equal conversation. 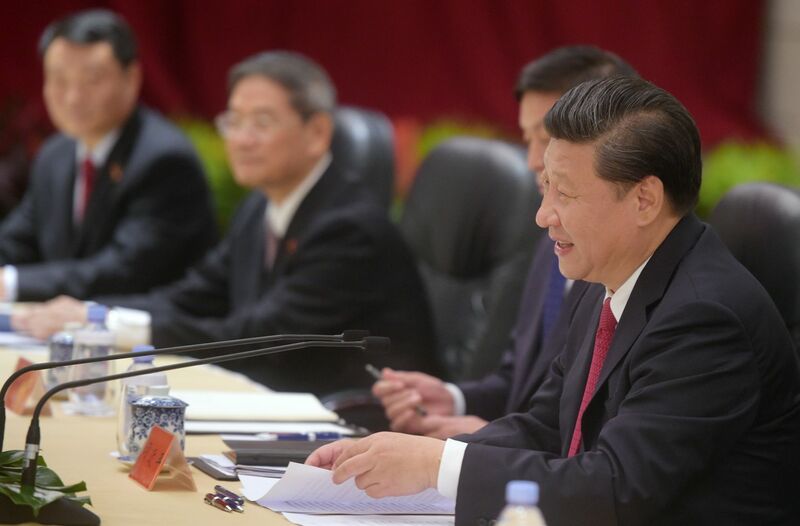 The Xi-Ma Singapore meeting does not have any substantial protocol, at least none publicly. The participants chose Mister as their title of address in order to avoid embarrassment in touching the sovereignty issue – China is extremely sensitive to titles president or congress. Mr. Xi and Mr. Ma shook hands for the camera, leaving “historical pictures”. Then came closed-door talks and a separate press release. Not surprisingly, Ma continued to push for integration within “Great China Circle” by suggesting more open policies for Big Brother Xi to consider, including hot lines at high levels and more access for Chinese undergrads to Taiwan’s universities. And the most important issue they wanted to emphasize is the “one China principle”, that both sides belong to one united China. They wanted to set this meeting as an exemplary precedent that all Taiwan administrations, especially the next, which is likely to be dominated by the pro-independence “Pan-Green Coalition”, follow their steps in this track. Since the pro-China Kuomintang is collapsing in Taiwan’s political map due to popular reaction against these pro-China policies, both China and Kuomintang find that they have to buy time to lock Taiwan into this “one China” cage. There used to be tense confrontations between both sides in cold war times. In 1992, civil institutions of both sides who actually have official authorizations had a talk in Hong Kong with no consensus. But after several years Kuomintang claimed that there was a “1992 Consensus”, saying both sides belong to “one China” when Kuomintang lost Taiwan’s general elections for the first time in history. Since then, both Kuomintang and the Communist Party have insisted firmly that the “1992 Consensus” and “one China principle” are the cornerstones of cross-strait relations, so all should obey this imagined “consensus”. They invented this consensus to block Taiwan into a “one-China” framework and have been using it as a political weapon to attack the pro-independence Pan-Green Coalition. And since then, Kuomintang and the Communist Party, two Chinese nationalist parties with the same Leninist origin, have formed an alliance to integrate Taiwan into China’s sphere of influence in all aspects. The Xi-Ma Singapore meeting is also built on such inter-party “consensus”. The Ma administration, the most pro-unification government of Taiwan, is always eager to step towards integration or even de facto unification with China. Mr. Ma is unlike other Taiwan leaders, who at least keep a necessary vigilance about China’s ambition to annex Taiwan. During Mr. Ma’s presidency, especially in his second term when he did not have electoral pressure, he has implemented policies to strengthen the integration with China in economics, ideology, and even national defense and diplomacy. Face-to-face meeting with the Chinese top leader is one of Ma’s final dreams in his “one-China” career, and what he believes to be a peak moment marking his legacy. Under Ma, Taiwan welcomes China’s hostile acquisition to her media and core industries, builds a “comprador class” that benefits hugely from cross-strait crony capitalism, and bows to Chinese chauvinist ideology. But Mr. Ma’s legacy is nothing but a disaster to Taiwan, even to his Kuomintang, a pro-unification party which still makes Chinese nationalism its top principle. China has claimed Taiwan as its territory “since ancient times” and never hides its wild ambition to annex Taiwan by all means, including military attacks. Standing firmly on its “one China” ground, China always pretends to “open the door to talk” and gives small favors and then believes that it has every right to internalize Taiwan’s affairs by military threats and suppressing Taiwan’s international space (especially its cooperation with U.S. and Japan). At the same time, China has spared no efforts to reach de facto control over Taiwan by all overt and covert means. And Ma Ying-jeou, who used to win elections as a charming political star and has held a firm faith in Chinese nationalism and unification all his life, is a good guide and assistant for China’s unification strategy. Ma has made good use of his executive power, his leadership in Kuomintang and Kuomintang’s dominance in Taiwan’s politics to make Taiwan open herself entirely to China’s penetration by money, population, and propaganda. Under Ma, Taiwan welcomes China’s hostile acquisition to her media and core industries, builds a “comprador class” that benefits hugely from cross-strait crony capitalism, and bows to Chinese chauvinist ideology. Yet these “selling Taiwan” policies have aroused the anger of Taiwanese people and raised their awareness of Taiwanese identity. And this has directly led to Kuomintang’s landslide election failure and loss of territory on the political map in recent years. Though Kuomintang has held a dominant position, no one doubted that they were doomed to lose the presidency and the congress to their pro-independence rivals on Jan. 16, 2016. Since political power will be transferred to another group of people with opposite ideas, both Xi and Ma think it is necessary to catch the last chance to block Taiwan further into “one China” framework to make it harder for Ma’s successor to jump out of this cage. This meeting is by no means a historical image of reconciliation or a progress towards friendship. It is not an equal conversation. All the signs of Taiwan as a sovereign state – the flag, emblem and press cards with their special Minguo Chronology – are strictly banned when there are Chinese officials nearby to satisfy the Chinese. Though the so-called “1992 Consensus” means “one China with different interpretations”, Ma only dares to emphasize “one China” rather than question the existence, not to mention the Orthodoxy of the Republic of China in front of Xi. The pro-unification policy opens Taiwan to China, making it easier for China to influence Taiwan’s public opinion and core industries, but brings no benefits but only economic stagnation and serious threats to Taiwan’s mostly cherished freedom and democracy. The people in Taiwan have been awakened by the dangerous plans of dignitaries on both sides of Taiwan Straits, which directly leads to the structural changes in Taiwan’s political map. The “Blue bigger than Green” structure no longer holds and Kuomintang is facing landslide failure in elections. The people’s response is the best response to their Kowtow policies, including this Xi-Ma show in Singapore.